The rub with live albums is that if you weren't there or are just discovering an unknown guitarist, these types of recordings often fail to reach you personally. 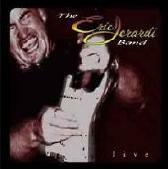 Eric Jerardi plays the blues with a Steve Ray Vaughn flair and he sings with a great tone that marries his guitar with his style. Although this is a live album, it proves that when a guitar player with this kind of talent is on a stage instead of in a studio the sound is more of a performance for the audience rather than the studio guy with headphones on. Eric has the talent to break down a song and parlay the music in his soul through his guitar. I have always admired those who can play the blues: Gary Moore, Magic Red and a few other deserves such recognition and we should always remember where rock'n'roll came from. Eric has toured with Robin Trower and it has helped him musically and, with Curtis Sanford on drums, he is surrounding himself with the best. This release is a live version of some of his other songs and Eric pours emotion into each track to garner a great set. "Pain" is his slow track here while "Pipe Stuff" is a surf/blues little ditty. "My Blessing's My Curse" has the best riff. Performing on "Live" are: Eric Jerardi - guitar and vocals; Kelly (Rat) Nickoll - bass; Curtis Sanford - drums. For more information, check out http://www.ericjerardi.com. Copyright © 2006 by R. Scott Bolton. All rights reserved.